The Gibson Long Practice chanter has holes that approximate the pipe chanter spacing and are countersunk to make them easier to feel. 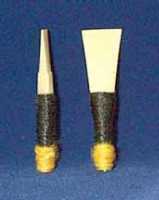 The chanter is also very easy to reed and has a very pleasant tone. The chanter has a short mouthpiece and barrel which makes it easier for youngsters or others with shorter arms to reach the holes, however very young pipers whose hands are still small may have some trouble spreading their fingers out to reach all of the holes.